Carol begins each day grateful for the opportunity to work with children and collaborate with adults on this holy ground named after God’s Heart. Carol graduated from the University of Missouri, St. Louis with a bachelor of science degree in elementary education K-8, special education K-12, and earned certification in learning disabilities. Recent professional development has included completion of graduate coursework in the Wilson Intensive Reading Program. Carol’s professional career has been devoted to experiencing the joy of learning through the eyes of children. In her early years, she taught for the Special School District of St. Louis County. 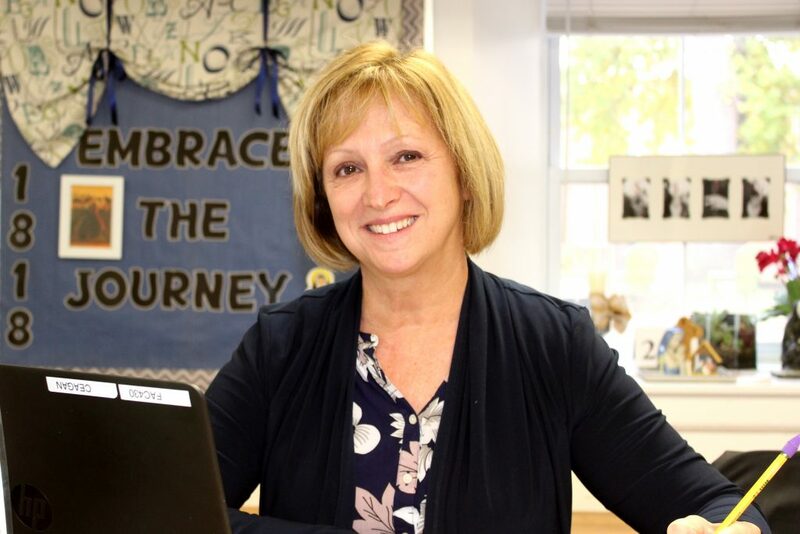 For the last 20 years, she has worked as a resource teacher and learning consultant, focusing on strengthening the individual needs of students and supporting their families. 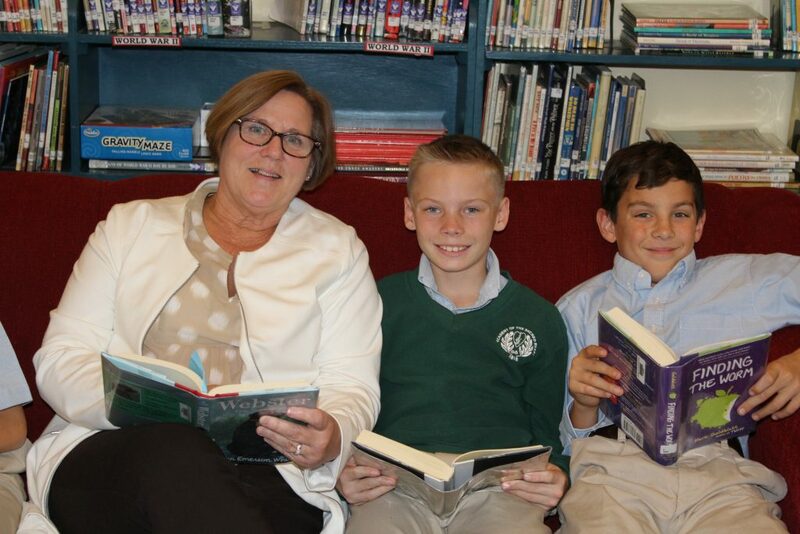 Guided by the Goals and Criteria of Sacred Heart Education, she strives to inspire students to develop a lifelong love of learning with an educational focus on the each child’s individual talents. Mother of two daughters and grandmother of five, Carol and her husband especially enjoy visits to St. Louis attractions with their family. While at home, she enjoys reading and gardening, and has the constant attention of furry pooches Gracie and Seamus, who enjoy frequent walks around the lake at Creve Coeur Park. From an early age, Sue knew she was going to grow up to be a teacher. Excelling in physical education and athletics, she decided to continue with that as a career. Her long-term goal was to teach and coach basketball at the college level. Sue attended Saint Louis Community College at Meramec where she played intercollegiate basketball for two years before completing her degree at Southeast Missouri State University, majoring in physical education (K-12) and minoring in health certification (K-12). She was hired to teach and coach volleyball and basketball at her alma mater, and completed five years there. She decided to return to school to pursue her ultimate dream. 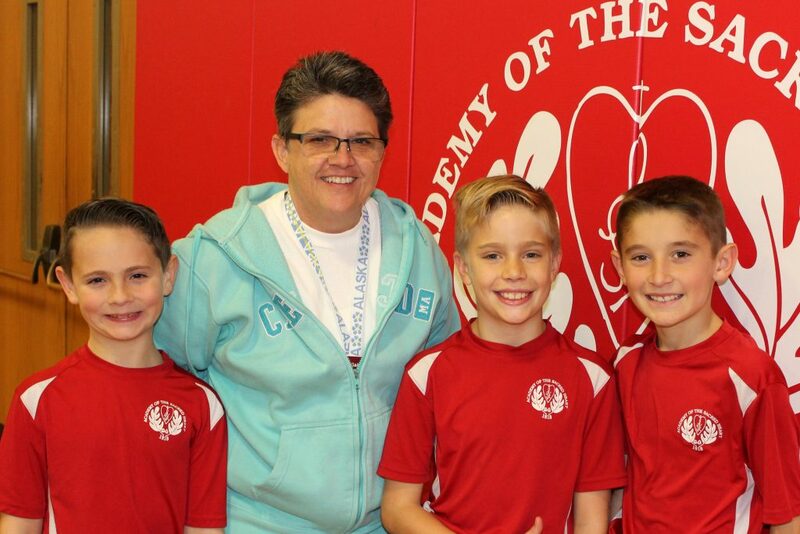 While attending the University of Missouri, Saint Louis in pursuit of a master’s degree, she hired on at the Academy of the Sacred Heart to teach elementary physical education. Sue sees her responsibility as a physical educator as one of the most important roles in the school. She loves the opportunity to teach students from an early age how to live a healthy lifestyle and how important it is to become lifelong movers. She firmly believes that all students are special, that each possesses a wide variety of talents and skills, and that it is her mission to expose all students to a wide variety of activities to encourage them to discover and enhance these skills and talents. Her desire to stay current in her field motivates Sue to utilize the most up-to-date educational practices. Sue’s dream changed from thinking she wanted to work with the oldest learners to dealing with the youngest possible learners. She believes that she has the best job in the world. Beth has a dedication to St. Philippine Duchesne that started as a young student at ASH. As an adult, she had the opportunity to experience Philippine’s canonization in Rome in 1988. Here is a glimpse into why she has become a teacher. “At age 12 I was asked by my swim coach if I would like to be a swim instructor that summer. I was hooked! I loved teaching, watching a child learn something new, and realizing I had a natural ability to communicate and break down skills so my students were successful. Many of Beth’s years were spent teaching Third Class, “where the children erupt with joy of learning.” Of her years teaching First Class, she remembers, “each day I smiled at their ability to absorb new material and at their beautiful innocence to live in the present.” Her new role as librarian and Kaleidoscope teacher allow her to bring the love of literature and adventure to the children. Beth received her education degree from the University of Missouri where she was a member of MU’s first women’s swimming and diving team. Her passion for the sport led to many summers and much free time spent coaching for USS Swimming and Diving. She also loves to travel and has been blessed to visit many countries, which helps her to share world experiences with the children. She continues to provide experiences in creative and exciting lessons that use hands-on activities and technology to support learning. In her free time she loves being with her family and going to garage sales with friends. While working at a camp for physically handicapped children when he was a student at Lindenwood University, John was moved by the opportunity to make a difference in the lives of children. The experience inspired his own passion for teaching and coaching children and the Academy of the Sacred Heart offered the opportunity to teach the whole child–academically, spiritually and emotionally–in a meaningful way. In his time at the Academy, John has taught physical education, American history and computer science; served as the Dean of Students for Boys; coached soccer, basketball and track, and served as the school athletic director. Continually seeking to grow as an educator, John is a member of the ISTE (International Society of Technology in Education). 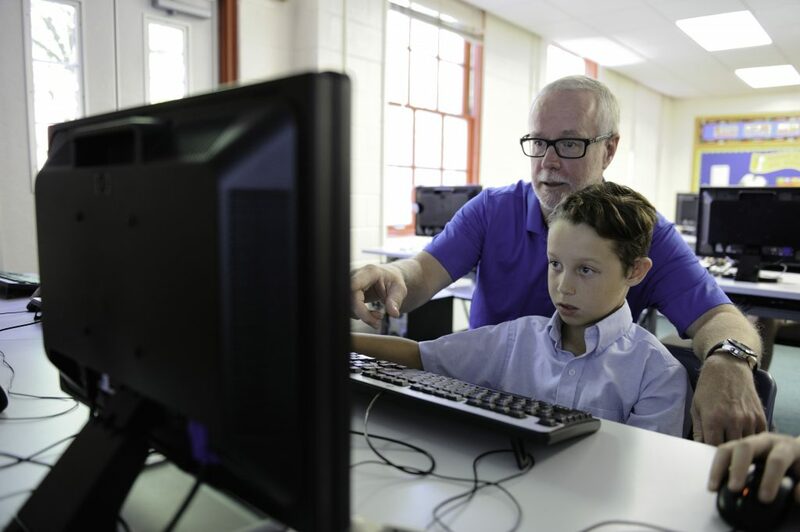 Over the past two years he has attended the ISTE 2015 in Philadelphia, Pa., completing workshops in computer science and mobile application development, the Code Studio Computer Science Fundamentals Curriculum Workshop for K-5, the Developing Leaders Seminar presented by Tim Elmore, “What Great Teachers Do Differently” by Todd Whittaker, and the 2017 NCEA (National Catholic Educators Association) Convention. An Academy alum and parent of four ASH graduates, Laurie Strickland is thrilled to be the music educator for Primary – Eighth Class. The Academy has a rich tradition of music through education, performance and worship. 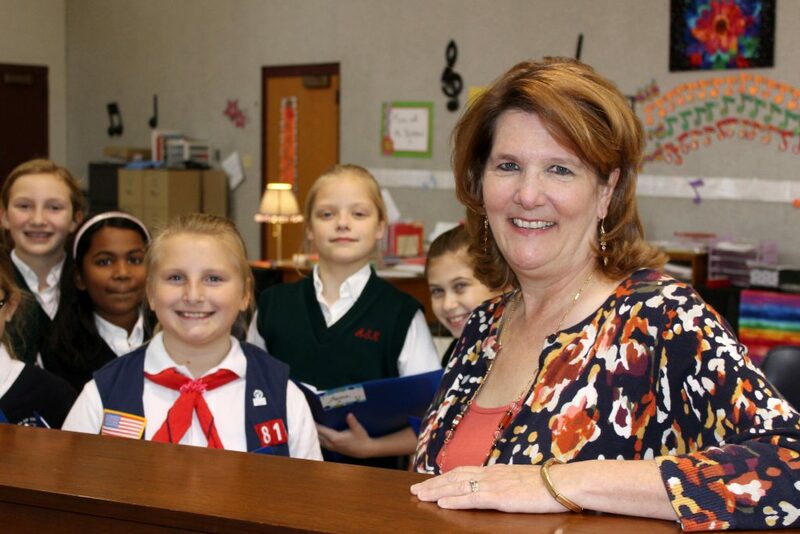 Prior to joining the faculty, Laurie taught music and enrichment classes after school at ASH since 2007. With degrees in music, education and business, Laurie has taught in both the classroom setting and privately for over 30 years. Her vast performance experience includes singing in the choir for the historic St. Louis Papal visit of St. John Paul II, performances in cities across America including Chicago, Atlanta, Fort Lauderdale and San Francisco, as well as the St. Louis MUNY. She has performed at the White House with The Patt Holt Singers on three occasions and in 2014 sang for President and Mrs. Obama. Laurie has served as music director for the The Patt Holt Singers and Just Kids and was a producer for their Christmas CD. She is a founding member of her church music ministry at St. Elizabeth Ann Seton Church and was the music director for Vacation Bible School for 12 years. In the summer, Laurie keeps busy with Showtime!, a performance camp at ASH, as well as serving as co-music director for the stage shows at Six Flags. She enjoys composing songs for worship and student performances and volunteers for Community Living. Laurie lives in St. Charles with her husband, Jeff.